current trends and to create long-term possibilities for employees? As a professional involved in hiring in the healthcare industry, what should you be aware of? Get the expertise and insight you need to gain a vital competitive advantage. 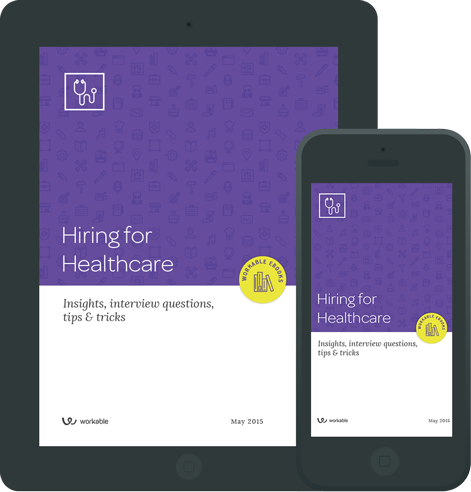 All the analysis, job descriptions, interview questions and letter templates you need in one free eBook. new jobs in US will be in healthcare. Navigate the skills gap Learn where the hiring crunch is at its toughest and what you can do to about it. How to ask the right questions Model interview questions that will help you make the right hire. Secrets of staff retention How to treat your employees as well as you want them to treat your patients. Top templates The best approaches to offer and rejection letters that ensure a good candidate experience. The hiring guide every startup should read. Templates, tricks and storytelling tips to refresh your job ads. Try Workable for free and get your ad on all the best job boards today. No downloads or credit card required.